This month, I was inspired by the Monthly Organizing Round-Up at Organizing Junkie. For the month of May, it was all about a surface or shelf. I decided to tackle the shelving for all the kid's toys and books. I have tried to organize this area several time in the last year, but have never quite been successful. The biggest problem is that there is TOO MUCH STUFF! Before trying to organize everything, I really needed to PURGE. I took everything out, sorted it all into keep and clear out piles, then put the keepers back in an organized way. I cleared out one box of books and puzzles, and a garbage-size bag of toys and stuffed animals. The before and after pictures tell the whole story. Now every item has a home and there is room to spare on the book shelves and in the toy bins. Thanks to Laura at I'm an Organizing Junkie for inspiring me to keep working at getting my home in order. "Better is a dry morsel with quietness, than a house full of feasting with strife." This week's devotional was a perfect reminder of the benefits of all the purging I have been doing for the last several weeks - less is best. There is a freedom and peace in not having so much clutter and stuff to maintain. I originally meditated on this devotion last Sunday, but have prayed this prayer several times this week - as I sorted through the clothes I had saved from the kids, as I got rid of all the maternity clothes I had "just in case", as I purged the book cases of books I meant to read but never have. Yesterday we sold all the stuff we had purged in a yard sale. There was no sense of loss, just a feeling of peace and joy as everything we sold our extra "baggage" to people who will hopefully enjoying using it. God has been so faithful! We still have a long way to go before we have purged every area of our home, but I am encouraged and know that God will answer every time I cry out for help. I have saved too many things over the years and, as a result, I have too much clutter. I have attached to much value and meaning to ‘things’ and have a hard time letting go. Release me from these feelings that prevent me from getting my home in order. Guide me so that I know what to keep and what to clear out. Teach me to trust you for all that I need, so that I can get rid of the things that I haven’t used, looked at, taken out, or needed in years. Give me peace as I purge our home of all this stuff. Thank you for your blessings and for your provision in all our needs. Today was our YARD SALE! This was the culmination of all our weeks of preparation. Around 7am this morning, we began carrying out the piles of stuff that were ready for the sale. The crowds started around 8:30am and continued strong until about 1pm. While I was running the sale, my hubby was playing the kids. He came out around 10:30am to catch some pictures. Below are some shots the sale in progress. By this point, we had already sold a significant amount of stuff. This is an overview of our portion of the yard sale. This is a closer shot of some miscellaneous tables. It looks like a mess, but it was fairly well organized. The weather was wonderful ... not to hot, not to cold, and NO RAIN! I took everyone's advise and kept prices low to make things to really move. There were a few times that I probably should have charged a little more, but my biggest goal was to get rid of all this stuff. My hubby graduated from Seminary this weekend and is now officially on summer break before starting his PhD work in the fall. He had tons of work to do, both in his business and preparing to start his dissertation, but has volunteered to spend some serious time getting ready for the yard sale. Today we hit the kid's closet ... again. The good news is that we finally finished our first pass of their closet. The bad news is that there is still so much stuff ... but the rest will have to wait until the next pass when we are actually packing. We pulled out all the stuff we needed to sort through and put the kids down for their afternoon nap. Then we started purging. My hubby tackled all the games. 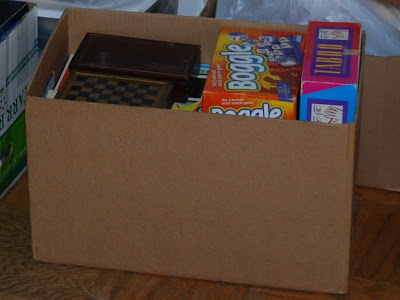 This box is full of games that we haven't played in a while, and can find easily when we return from Scotland in three years (but I might have to keep Boggle). 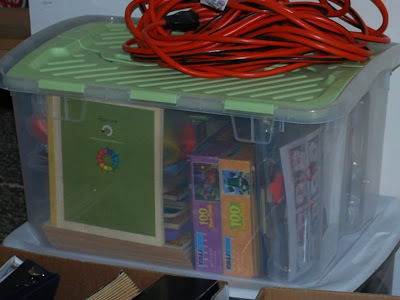 I started sorting through all the kid's stuff that was in the closet - puzzles, toys, books, art supplies and more. Of the two full storage containers, I cleared out an entire container. The remaining container is not full and most of it will be cleared out at the end of the summer when we move. Here is the container of stuff that we are putting in the yard sale. In the kid's room, we have a metal trunk that is always full of stuff. It was my intention to clear out the trunk and put it in the yard sale. However, once the trunk was empty and sitting pretty in our living room, I decided that we didn't have to get rid of it. This old army trunk has served us well through the years. I picked it up at a yard sale for $5 back in my college days. I've painted it several times -- right now its a well-worn navy blue. It has been used as a bench, as a coffee table, and for random storage. I took a good look at this sturdy, old trunk and realize I still really like it. But we did clear out all the stuff that has been stored in it for the last several years. When we finished the games and the trunk, there was still a sleepy silence from the bedroom and I decided to hit the play area again. This is my third pass of this area and I still only cleared out one bag full of toys. There are so many books and toys that we are not going to store for the next few years, but the kids need to keep busy for the next few months before the move. Below is the final picture of all that we cleared out today. We are quickly running out of time, but we have great progress. I have a list with a few more key areas to hit. In the mean time, I better start thinking about how to set up this yard sale and how to price everything; and remember all those crazy details of yard sales like having change on hand. 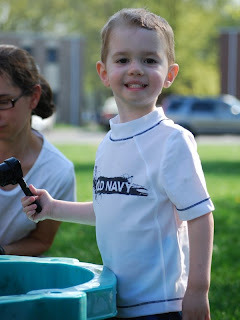 Do you have any tips you learned about successful yard sales? Anything you did right (or wrong) or would do differently next time? Or maybe something you really liked (or disliked) about yard sales you have visited? Please share your wisdom and insight. "Consider it pure joy, my brothers, whenever you face trials of many kinds, because you know that the testing of your faith develops perseverance." Rejoice! Consider it pure JOY! Be joyful in your trials, in all things, especially in the bad things! Do I have to confess that this is a big struggle for me? I do not exude joy in my trials, small as they are. Instead, I complain and make a big deal about it all. I remember an incredible Christian woman I worked with at my first real job when I was 16. She was a truly joyful person, all the time. I know that her husband was having serious medical complications and there were some hard things going on with her kids, but she was still always joyful. It caught everyone’s attention! She had amazing opportunities to minister to others because of her attitude. It attracted people, and they were curious and asked questions. That is the kind of person I want to be. Rejoice in the Lord always! I will say it again, REJOICE! Thank you for the trials that I go through that help me learn perseverance. Please give me strength during the times that drag on so that I may learn to be joyful in all things. Remind me that you are using these times as a chance for me to grow into a more patient person. Show me the times I am not being patient or perseverance in love; when I am not walking in your joy (which is my strength). Help me to wait on you for the answers to my struggles. Only through your strength and help I will persevere joyfully. Darren posted an update on our schooling options for next year. 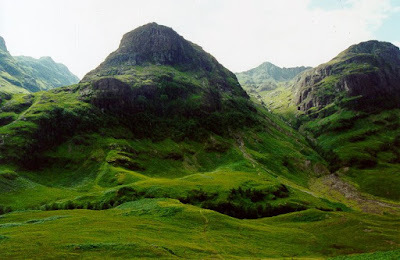 Check it out on his blog: Aberdeen or Edinburgh? However, please note that things seem to change every day. I know for a fact that today Darren was more inclined to Edinburgh (though yesterday and in his blog post, it was Aberdeen). We will let you all know when something is actually decided. Right now we are discussing, debating, listing pros and cons, and praying. We would appreciate your prayers as well. 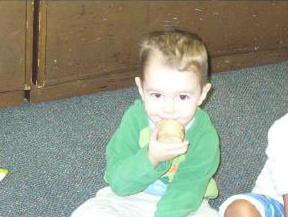 Joshua's class spent the month of May exploring potatoes! What fun! 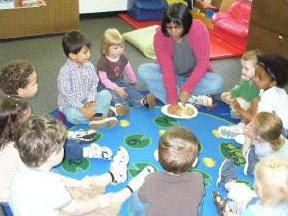 This week they had their big potato feast to celebrate all they have learned. Here are some pictures from this month. The kids are checking out the outside texture of a potato. 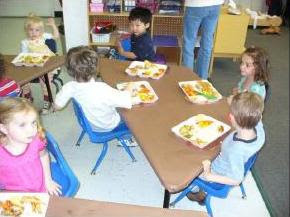 Joshua is the one in blue and red stripes. Ms. Bela is cutting open the potato. 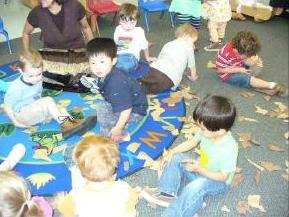 Joshua is next to her, in the green. What does the potato smell like? 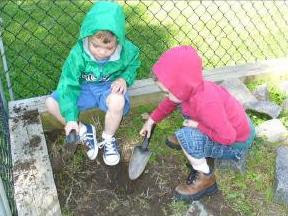 Joshua, in the red, is helping prepare the garden area for planting their potatoes. 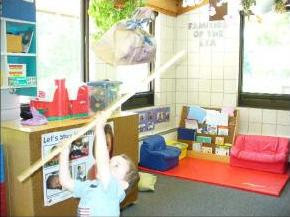 Joshua taking a swing at the potato pinata. 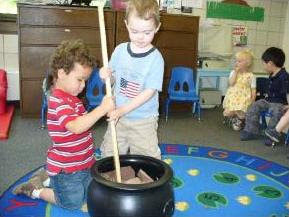 They are making a big pot of potato stew! 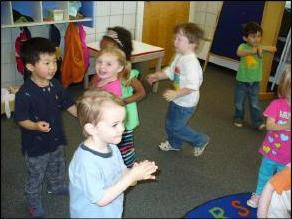 Dancing the Wiggle Hot Potato. They are stomping their own mashed potato casserole. Enjoying the fruits of their labor -- the potato feast. They had mashed potatoes, tater tots, french fries, red potatoes, sweet potatoes, hash browns, and more. What a wonderful time of learning and fun! And now Joshua is excited about potatoes. I had great plans for blitzing yesterday, but I spent most of the day with a migraine and got very little done. This seems to be a pattern lately. This time, at least I know what triggered the migraine ... I didn't keep myself hydrated. In spite of the down day yesterday, I found 30 minutes for blitzing this afternoon. It was a brief cleaning session, but now the house feels a little more organized, even if it still needs some deep cleaning. I'd love to hear about your blitzing or cleaning. What do you do for spring cleaning? 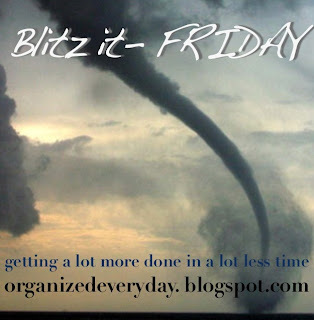 Check out more great blitzing at Organized Everyday. Can it really be only nine days away? I feel like there is too much left to be done. Especially after two days of not really accomplishing anything in the way of purging. This morning I spent another hour in the kids closet. I didn't count exactly what I cleared out, but below is a picture of the pile from this morning. I know, just what everyone wants to see ... piles of garbage bags. In addition to the clothes and miscellaneous items in the closet, I also started on the toys that are in their bedroom. My son is at preschool this morning, so it was a safe time to start sorting. Would you believe that I am not even half way through that closet? I have done the top shelf on one side and the floor on the other. There are still stacks of boxes and random items that need to be sorted. Only nine days to go! Joshua's school had their spring play a week or two ago. 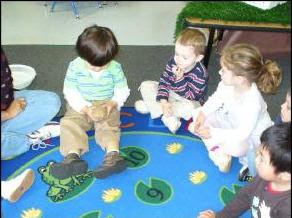 His class did a sketch and song about dinosaurs. Each child got to display a characteristic of dinosaurs that they had learned in class - there were dinosaurs with big pointy teeth, long tails, etc. Joshua was the hungry dinosaur. Here is Joshua in his costume. This is Joshua's shining moment - he is roaring his heart out! They are lining up for the dinosaur march. They marched to “We Are The Dinosaurs” from Whaddaya Think of That? by Laurie Berkner. Joshua loves this song! He is marching with his fellow dinosaurs, until they stop and eat their food, or rest in their nest. Then they roar! It was a fun production, and Joshua did beautifully. We are so pleased with how much he has grown these last few months. Wonderful! There was no work toward the yard sale today, but I did work on something else! Baby Books! When we had our son, we were given a baby book that is mostly fill in the blanks and add some pictures. I loved it so much that we got the same book (girl version) when our daughter was born last year. But I have not done as well with her book (something seems to happen with the second child). Well ... I won a gift certificate to Shutterfly and they offered 25 free prints for mother's day. I decided this was the perfect opportunity to order some prints for my daughter's baby book (and a few more of my son as well). Those pictures arrived today and I was so excited to get started. Tonight, after the kids were asleep, I pulled out the baby books and added all the pictures! Now both baby books are almost complete. It didn't help us for the yard sale at all, but it feels really good to know that I caught up on this one project before the books go into storage for the next three years! "A man’s heart plans his way, but the LORD directs his steps." These last few weeks my head has been spinning with all the planning required for our probable move to Scotland this fall. But our plans are really not set yet, and the options and possibilities keep changing. I have found myself getting my heart set on certain options, instead of seeking God's will and waiting on him to direct my steps. Then, I feel impatient or frustrated when things change. I become like a child, wanting my own way; sometimes I even throw my own temper tantrums. But, as my loving Father, God gently reminds me to calm down and allow him to direct my steps (hopefully I listen to the still, small voice, and don't end up needing further correction). Even as I direct my children to keep them safe and to help them learn and grow, God faithfully directs my steps. I admit that too often I want my own way; I make my own plans; and I have stubbornly done my own thing, without seeking your will. Soften my heart to listen to you and wait for you to direct my steps. Lead me in the way I should go. Give me your wisdom and stir me to obey you, knowing that your way is the best way, the only way. Thank you for loving me, as you child, and disciplining me when I stray. Teach me and help me to grow into the person you want me to be. Is any day ever as productive as I envision it? Probably not. I guess there is comfort in the fact that I will never run out of things to do. I just never feel completely satisfied with what I accomplished (or really, what I didn't accomplish). That being said, it was a fairly productive day and I was able to tackle some tough areas. Still no pictures, though. I could share a shot of the pile of bags, but there are not any good before and after pictures because I'm only clearing out a small area at a time. This morning, I spent about a hour working on my kids closet. They have the largest closet in the house, so it is used for general storage and collects junk very quickly. I was a little emotional this morning. 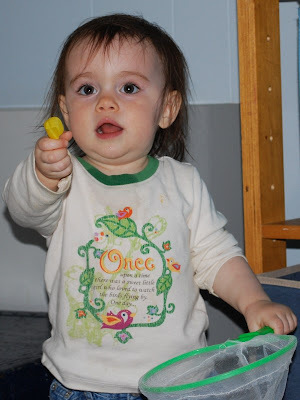 I decided to tackle the baby clothes that I had saved from both of my children. I started strong, but ended poorly; and decided that I needed to finish another day. Now keep in mind that I have already sorted through these boxes several times. The clothes that are left are the ones that have the most emotion tied to them, the ones I couldn't part with the last few times I tried. Does any one else have this problem? Why do I let clothes have an emotional pull on me? Even with the emotional difficulties, I managed to cleare out one (12-gallon-size garbage) bag of blankets and other infant stuff, and box of random items, including the bath tub, picture frames, etc. I also cleared out two bags of clothes, even though I still kept a few too much and need to take another pass when I'm feeling stronger. The evening, after the kids were down for the night, I went into my bedroom to clear out a few more things. We have a cedar chest that is stuffed with sheets and miscellaneous linens. That purge resulted in two bags of items for the garage sale. Then I sat down to tackle all the sheet music and hymnals that I have collected over the years. I haven't played the piano for church in over ten years, but I still have all the old music and books. I only kept four books (two of them were old hymnals that belonged to my hubby's grandparents) and condensed the sheet music to one binder. This wasn't really a priority for the garage sale, but still needed to be done before the move. There are less than two weeks left until the yard sale. My hubby is starting to think I am crazy. I am also realizing that there is a lot of stuff that we need to use this summer before our move, so it will not be going in this yard sale. We are definitely going to have enough stuff for a second sale in July, right before we leave. Just think how organized I'll be when we no long have any stuff! Happy purging! I had great plans for blitzing yesterday, but I spent most of the day with a migraine and got very little done. However, I did spend 30 minutes blitzing my kitchen this morning (it is amazing how quickly our kitchen gets messy, especially when I'm out of commission for a day). I meant to sweep the floor as well, but the kids were going full speed by this point. It will have to wait until tonight when everyone is down for bed. We are at T-minus 15 days to the big yard sale. Wrote a list of all the big items that are being sold so I don't forget anything on the big day. Evaluated anything that needs to be done to items being sold, like washing seat covers, etc. Prioritized areas of the house to hit next (some areas will have more for the yard sale, and some will have more to just rid of). I'm hoping to get a little more done after the kids go down, but we'll have to see how much energy I have by this evening. 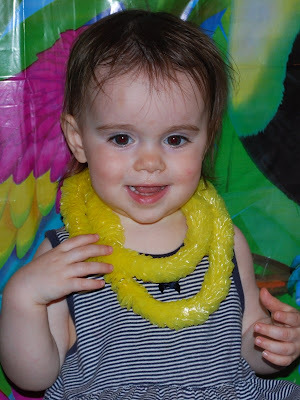 Last weekend, our friend's daughter celebrated her first birthday! They went all out and hosted a beautiful Hawaiian Luau. 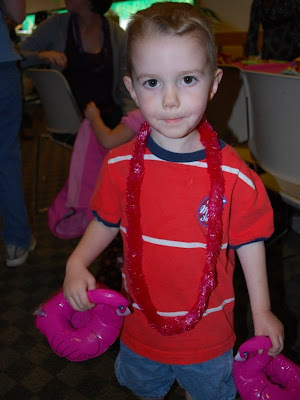 Joshua loved those crazy flamingos and carried them everywhere throughout the party. Abigail loved her flower lea, though she wasn't sure she wanted to smile for the camera. It was an amazing party! Great food, fellowship and fun! 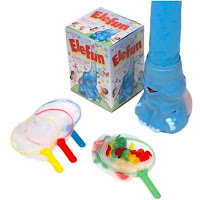 When we were out visiting for Christmas, my mom bought the kids this great game, Elefun, to play while we were visiting. We played it a few times, but Joshua was not really into it. Recently, Joshua was at a friend's house and they have this game. His friend loves to play and got Joshua very excited about it. Now he wants to play all the time, over and over again. I'm so glad Grandma sent the game home with us. In this game, the elephant blows 30 feathery, vinyl butterflies from its 4-foot trunk into the air. 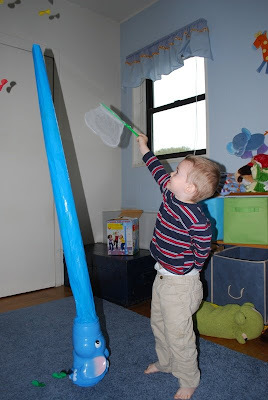 Kids use mesh nets (four included) to capture the butterflies. Neither of the kids is very skilled at catching the butterflies, but they get excited just the same. 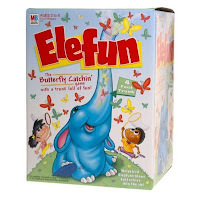 Abigail's favorite part of the game is picking up all the butterflies and putting them back in the elephant. 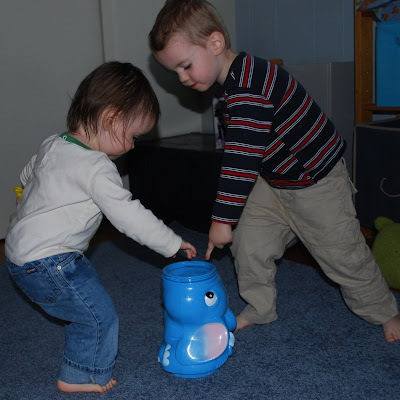 Joshua is pointing inside the elephant, instructing Abigail where to put the butterflies she found. Abigail loves to hold the net and pick up butterflies from the ground. Joshua strategically places his net near the trunk and holds it there the entire time. Normally he picks the perfect spot where several butterflies fall into his net without him having to chase them. Great game for kids! 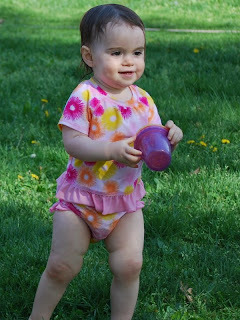 And, if you can convince them to actually chase the butterflied, they can get some physical activity, too! Joshua could play this 50 times in a row without getting bored, which is wonderful on a rainy day! Last time we talked (see previous update here), we were waiting to hear back from three schools about Darren's application to the one-year Master of Theology degree - University of Aberdeen (our first choice), University of Edinburgh and Princeton. On Thursday, Darren received an email from a Professor at Aberdeen (John Webster, with whom he has been in contact during this process). The email stated that the school was ready to mail Darren an offer letter, but wanted to know if Darren was interested in doing a PhD instead of the one-year MTh. Wow! We were taken completely by surprise. It took all weekend just to get use to the idea of spending three years in Scotland, instead of one year. Darren also had to adjust his thinking to the idea of a U.K. PhD instead of a U.S. PhD. After a conversation on the phone with John Webster, many discussions about what this would mean for our family, and some serious prayer, Darren told them to send a letter for the PhD program. So, we are going to Scotland next year! About the next few months ... we plan be in Princeton until the end of July, then we will travel to the Northwest for a few weeks to visit family and friends. In September, we will be off to Aberdeen. More info to come soon! Be sure that everything is done properly and in order." Can these words be used to describe my home? my life? my heart? Recently it feels like I can hardly keep my head above water, let alone do things "properly" and "in order". This chaos isn't just about my home, but it is about my life and the way I am choosing to live. I was convicted this week about the state of my heart, and how I have let the chaos around me invade my time in with the Lord, leaving me dry and thirsty. This needs to be addressed first, before the other issues can be properly addressed. I am struggling with my lack of organization. So many thing are suffering because of it. But the one that has suffered the most is my heart. I pray that you would bring me back to the place I need to be so that my whole being my be properly ordered. I know that when this happens, other things will begin to fall into place. Create in me a clean heart and renew a steadfast spirit in me. We had some really warm days at the end of April. 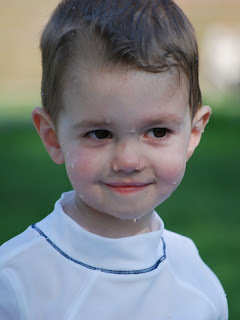 One day it was in the 90's and we all needed a way to cool down. Our apartment buildings had a spontaneous pool party. We pulled out our pool, and another family had their pool. 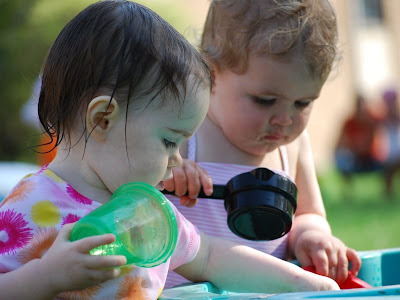 And soon there was a full size sprinkler and a spinning Elmo sprinkler running nearby. There were probably about 20 kids who showed up to cool down. It was great fun! Here are Abigail and Joshua sporting their new swim suits! 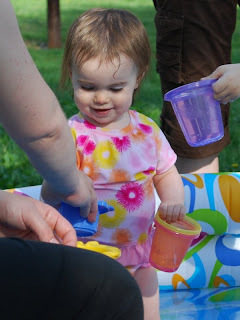 Here is Abigail playing at the water table with our downstairs neighbor girl. They are only two weeks apart in age. 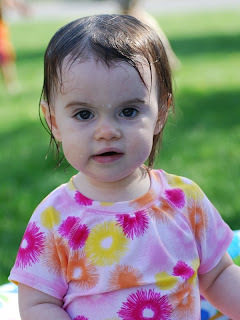 Abigail was fearless in the pool! Joshua is learning how to smile for the camera. 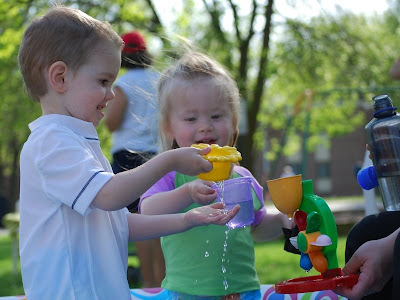 Here is Joshua playing with one of our neighbors! These two have been great friends since last summer! My two cuties! They had such a fun day! 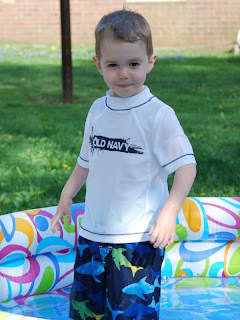 We are all looking forward to warm summer weather and more opportunities to play in the water with friends!